Hand puppet madness. Don’t just read. Go snap! Snap! Snap! Everybody is going to want a turn. Oh joy. Not just a funny story: a hand puppet too. We bet your storytimes have never been so snappy. Naughty Mr Croc has toothache. He needs a friend to help him. Trouble is, this sneaky villain gobbles all his helpers up. Have loads of fun snapping at toes and fingers as you share his cheeky tale. 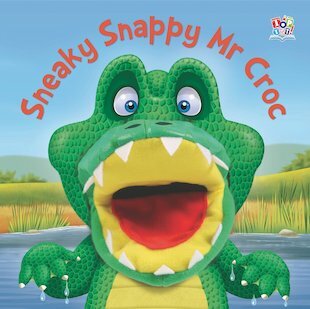 Will Mr Croc ever learn his lesson?